Musing 1. Why do new home sales data releases by HUD possess any significance? Maybe so that the HFT houses have a headline for an algorithm to pump millions of unfilled bids into a market. It’s baffling. For me, the most important part of a release by HUD regarding new residential sales is the Explanatory Notes. In this section they tell you how wrong their data could be and they lay out all the statistical errors that could be occurring due to things such as “bias, variance from response, nonreporting, and undercoverage.” Reported numbers are consistently displayed with standard deviations of plus or minus percentages in the teens or twenties. For example, September’s results show a 0.2% (+/- 15.7%) above revised August new home sales. That means the actual number may have been as low as -15.5% or as high at 15.9%. The dispersion is so wide as to render the results effectively meaningless, which is why there are always revisions. But why would revisions possess any more statistical relevance when weighed against the potential of HUD’s self-reported surveying errors? Observe the median sales price from August to September. It went from $275,600 at the end of the summer to $259,000 in the beginning of the fall. While the average price of a new home sale dropped from $348K to $313K. Drops of that magnitude have to make you question the credibility of the August new home sales pricing data. Did prices for a new residence actually drop that much in a single month or was it that the data was massaged to begin with? Not even the Census Bureau will provide a quality answer. I know the confidence level of the statistics is at least 90% but c’mon. Honestly. Can you imagine if other industries were allowed to utilize such wide standard deviations in their statistical reporting. Take biotech. “Each participant that takes the pill in the study has approximately a 50% chance of increasing their lifespan by 12 more years…plus or minus 40%.” Or how about plane engine manufacturers. “We believe this critical engine component will operate in extreme conditions with a failure rate of 0.03% (+/-72.7%)” These are extreme, outlandish examples to be sure, but you hopefully get the point. Admittedly, my statistical skillset is decidedly above the average dolt off the street, but assuredly below regular practitioners such as finance & economics professionals or academics. The book is still open on whether or not to reject the null hypothesis that MarginRich is actually just one of the said dolts off the street. Musing 2. What’s the big deal about oil reserves vs. oil resources? This musing stems from an article I read at Bloomberg that was titled, We’re Sitting on 10 Billion Barrel of Oil! Ok, Two. The theme was expanded on at Zero Hedge that potentially the whole petroleum renaissance is nothing more than smoke and mirrors. Now I enjoy Zero Hedge as much as the next bloke, but I wouldn’t expect them to so quickly jump on the extremist bandwagon when it comes to E&P’s sharing their opinions on resources. Precisely. Experienced and sophisticated investors know that resource potential is not the same as current, existing barrels of oil in ground. That doesn’t mean that through innovative techniques that a high percentage of those resources cannot be converted into reserves. Patience and demand are the keys to the development of refined exploration techniques that can continue to expand the US energy base. The article implies that the shale boom is potentially a large scandal waiting to blow-up with Enron-like repercussions. That is an epically gross exaggeration. E&P companies have time and again improved or grew reserves at rates consistent with estimates. Additionally, we’ve seen the oil and gas players consistently beat reserve estimates established by the EIA for various geographic areas. Any speculator in hard assets, knows what the steak and the sizzle are in natural resources. The reserves are the steak. The resources are the sizzle. It would help if more of the E&P players would utilize the P’s more in their presentations for the retail players who want to get in on the action. The P’s stand for proven, probable, and possible. Proven or 1P reserves have a high probability of being produced and you can count on the number. Then there is proven and probable, which is 2P; and then proven, probable, and possible is 3P. The higher the number of P, the less likely the company can produce the reserve. However, that doesn’t eliminate the current or future viability and economic potential of the resource. These P-designations, standard nomenclature in the industry, are easy to understand and not nearly utilized enough in company presentations. Oil and gas are no different than gold, silver, platinum, copper, or any other natural resource. All natural resource companies report reserves and resources and it’s up to the speculators to conduct their own due diligence. First Trust is an investment advisory firm founded back in 1991. They’re fairly sizeable in that through their assortment of ETFs, mutual funds, and other various products; they’ve been able to garner $32 billion in assets under management. A hefty sum by any measure, but very small compared to the biggest players in the game. The Monday Morning Outlook is a weekly little opinion piece that First Trust puts out that also includes a schedule of important economic releases for the week. Content is hit or miss with this shop, however, there was one piece from last month that struck me as an egregiously, cowardly article. You can have a read for yourself to see if I’m out of bounds in my assessment. I admit that based on my own opinions shared at this site, that I could be labeled a doom & gloomer, but I simply refuse to un-acknowledge the current and future distortions that have and will occur in asset markets around the world thanks to central bank interference. The piece titled Why Do Stocks Keep Rising?, from September 8th, pumps First Trust’s fist in the air behind a sis-boom-bah of how the markets have continued their upward ascent despite the steady flow of negative-impact events over the last 5 years. They don’t understand how pessimism can remain so ingrained for certain pockets of investors under such conditions. I know it’s a quick 1-page offering that they throw up every Monday, but you can’t just break out the pom-poms and then stick your head in the sand without truly acknowledging the reasoning of the very parties you are criticizing. Amateur hour! They don’t touch on how central banks have kept the cost of capital at virtually zero for longer than any period in history despite an “improving” economy and “improving” employment. They extol the virtues of the rising profits across industries but share nothing on top-lines and how that will affect profits going forward. Or how slashing SG&A and CapEx in combination with share repurchases has significantly affected stated earnings to the positive. Nor do they expound on how these behaviors are unsustainable. They fail to acknowledge that the current situation of central bank involvement in the developed nations has absolutely no precedent, and thus, no back-testable strategy for when the house of cards begins to wobble. As an investment adviser it behooves them to cheerlead so as to grow assets under management higher and higher. That’s fine and they have a right to share a one-sided puff piece. They should just try not to be so damn cowardly the next time they want to cheerlead investing in a rising market right before a 7%(which I stated will not be the low) haircut commences. Before signing off, I wanted to touch on the current action in the S&P 500. In my last article, I had stated that if the price action is simply a bounce within a larger correction that I thought the 1,950 area to be a solid resistance point before turning down again. Today’s close at 1,964 is still around 1,950, so we’re not quite out of the woods just yet. 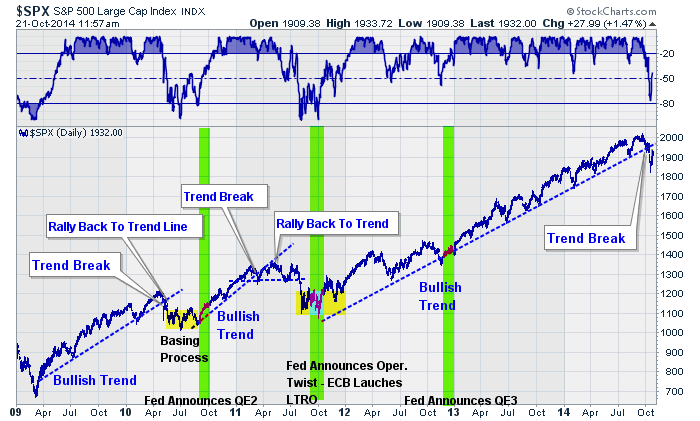 If we move onto sustained new highs then I will offer a mea-culpa, but I continue to think that caution is warranted. I’ll leave you with a chart shared by Lance Roberts at STA Wealth that displays the price action in the S&P 500 during the last two corrections that reached a depth of 10% or more.